The brightest and safest LED Dance Floors in the US – now available for permanent installation in your venue! 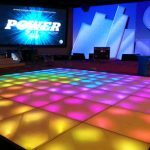 At In Depth Events, we’ve been at the forefront of LED technology for years providing our signature LED Dance Floors for rental all over the United States. Our clients include corporate parties, wedding receptions, fundraisers, and college parties. It would stand to reason that, sooner or later, someone would see one of our floors and want it permanently installed in their venue. It turned out to be sooner rather than later! Within 6 months of our first rental LED Dance Floor, we were contacted to provide an LED dance floor installation at a club in Detroit. Since then, we’ve installed our LED Dance Floors in casinos, nightclubs, private homes – we’ve even installed one on a Mississippi riverboat! Why do people select you for their installations? Our clients select us because our reputation precedes us. One of our most favorite installations was for the Officer’s Club at an Air Force Base (Pictured here) in our native Texas. Trust us – they won’t let you on an AFB without a level of confidence in your abilities. Casinos, nightclub owners, and other business people check references – and In Depth Events comes up as the best in the business – every time. But don’t take our word for it. Find out for yourself! Contact the installation professionals at In Depth Events for your venue. You’ll find our staff to be friendly and extremely knowledgeable in more than just LED Dance Floor installations. We can also talk to you about audio and lighting for your new venture. Ask Us a Question and let us show you our installation skills!